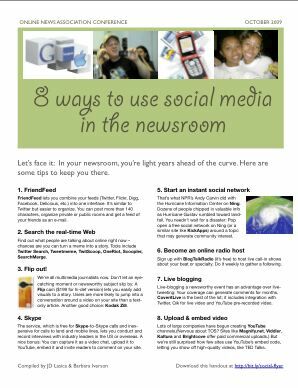 For the annual conference of the Online News Association this weekend, I’ve pulled together two new printable handouts: 8 ways to use social media in the newsroom, available at http://bit.ly/social-flyer, and 6 Twitter tools for journalists (PDF — and see the accompanying post). I’m speaking on the aptly named Social Media Mania panel on Saturday. I think these are two of the nicer handouts I’ve produced, using Apple Pages, part of the iWork suite. These downloadable documents are part of the ongoing series of social media guides and tutorials that Socialbrite has been producing for social change organizations, nonprofits, journalists and anyone interested in effective use of social media. While the PDFs are spiffy-looking, they’re less than optimal for search engines and for the disabled, so I’ll mirror the handouts here in html. 1An uber-aggregator of your feeds, FriendFeed is like Twitter but easier to organize. You can post more than 140 characters, organize private or public rooms and get a feed of your friends as an e-mail. But FriendFeed is more than an aggregation tool: It’s a virtual watering hole where you can see what’s on the mind of your friends and colleagues. 2Find out what people are talking about online right now — chances are you can turn a meme into a story. Tools include Twitter Search, Tweetmeme, OneRiot, Scoopler.